Despite its riotous appearance, rugby is actually a very organized, well-governed sport that is played all over the world. The rules of the game are rather basic and can be learned fairly quickly. If you know how to play American football, then you will learn the sport of rugby even quicker as there are many similarities. Here are the basics:• A rugby match is 80 minutes long. It is divided into two 40-minute halves and separated by a brief 10-15 minute halftime. Play is continuous and will only stop after a team commits an infraction, if the ball goes out of play, or when a team scores. • Two teams consisting of fifteen players make up the athletes on the field. Eight players take on the forward, or pack, positions. These players can be compared to the linemen and linebackers in American football. The remaining seven players are the backs. Usually smaller and more athletic than the forwards, backs are mainly responsible for handling the ball and trying to score. • The rugby playing field is 100 meters long and 68 meters wide. Lines and distance markers are placed on appropriate distances from the goal line up to 50 meters, similar to an American football field. On each end of the field is a goal line, or try-line. The scoring area, called the in-goal area, can extend 6 -11 meters past the try-line. There are H-shaped goal posts at the back of the goal area, just like football’s field goals. • The match starts with a kickoff from midfield and it must travel at least 10 meters. • If the ball goes out of bounds at any time, the ball is restarted by a line-out, which is similar to that of a throw-in in soccer. • To win the game, you must score more points than your opponent in the given amount of time. • Once a team gains possession of the the ball, they will try to advance it forward in order to approach the opponent’s goal line. • You may pass the ball to your fellow teammates, but only backwards. Throwing the ball forward is not permitted and will result in a penalty. • The only forward motion permitted (besides running with the ball) results from that of a kick. Although you may kick the ball forward, it is a risky move that may end up in a loss of possession. • If tackled by the defense, the player with the ball must release it and get out of the way so play can continue. • Unlike football, blocking is absolutely prohibited. • Rugby defense is a fairly simple concept that can be explained in only a few words: If the other team has the ball, get them. • Defense is not just about delaying and/or stopping the offensive attack, but it is also about getting the ball back into your team’s possession. • Stopping the opponent is done via tackle. You may only tackle the person carrying the ball, no one else. You can only use your arms when tackling; tripping and shoulder charges result in penalties when caught. Also, you must be on your feet when making a tackle. • Tries: A try is equivalent to that of an American touchdown, but only worth 5 points. This happens when a player holding the ball is in the opponent’s goal area. • Conversions: After a team scores a try, a conversion opportunity is granted to that team. They must kick the ball through the goal posts and if successful, is worth 2 points. • Penalty Kick: If a serious penalty has been committed, your team could be awarded 3 points. The ball is placed on the spot where the foul has been committed and is kicked between the goal posts. • Drop-Goal: Anytime during the course of the game, a player may drop the ball and kick it toward the goal posts. A successful attempt results in 3 points. • Any time your team scores, you are awarded the points and must kick the ball to the opposing team to resume the game. • Penalties are given by referees when a player breaks a rule of the game. • The most common penalties in rugby are offsides, obstruction, violent play and barging. • The offending team must move at least 10 meters back from where the penalty occurred. The non-offending team can try for an uncontested kick at goal posts (for 3 points), kick up the field and out of bounce to gain field position, or tap the ball with their foot to restart play and run the ball. • Minor infractions (or infringements) will usually result in restarting play through a scrum. 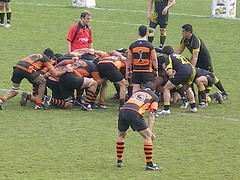 A scrum will also occur if a player is tackled and the tackling team doesn’t pick up the ball right away. • A scrum is executed by the two teams’ forwards binding and interlocking with one another. The ball is thrown into the middle of it, and players try to hook the ball back with their feet to their team for possession. Safety• Rugby is one of the most physically demanding sports in the world, and also one of the most dangerous. • Players have minimal padding, but can sometimes be seen wearing a leather cap or helmet for added cranial protection. Typically though, gear is limited to the jersey, socks, and cleats. Rugby is an exciting, yet brutally physical game. Be careful and have fun!